COMPETITORS WILL BE ASKED TO RECITE FROM ANY PLACE WITHIN JUZ AMMA. 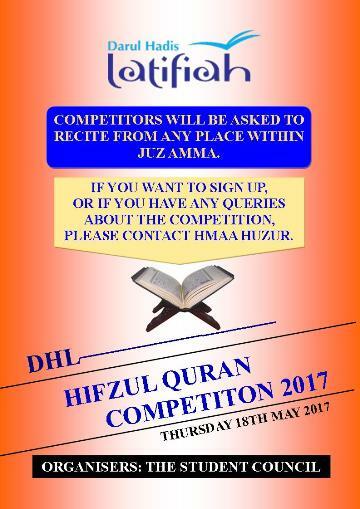 OR IF YOU HAVE ANY QUERIES ABOUT THE COMPETITION, PLEASE CONTACT HMAA HUZUR. We aim for the highest level of achievement in religious, cultural and academic performance by providing opportunities to pupils to reach their full potential. We are bound together by the values of: Faith, Truth, Fairness, Dedication, Respect, Excellence.